Tune into The Breakfast Spread on Wednesday November 21 for State of the Art with Annika welcoming A Nice Warm Bath curators, Carla Zimbler and Zoltan Fesco, in to chat about the upcoming Melbourne Music Week event. An immersive audio-visual experience, A Nice Warm Bath features ambient and experimental producers, sound and visual artists exploring light, scent and projection. Featuring Anatole (SYD), Hymns (DJ), Sara Retallick, waterhouse, ORCHA, Ju Ca, Jess Sneddon (DJ), Lee Hannah, and visual transformation by ASTERISM, Meagan Streader, Kate Geck, Rachael Archibald and virtual.amb. The Norla Dome at Mission to Seafarers will be a canvas for visuals reacting to atmospheric soundscapes, creating a restorative colour bath for people to slow down and sink into. Whilst the everyday strips us of energy, A Nice Warm Bath will soothe and replenish as sound and light transforms the dome into a healing, meditative space. 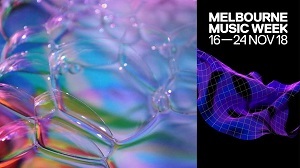 For more information and tickets head to the Melbourne Music Week website here. This event is part of MMW’s Self-Made series, which showcases and supports original, innovative music events by Melbourne’s emerging producers.